Broad Spectrum protection from UVA & UVB rays using the mineral Zinc Oxide – NO oxybenzone, octisalate, octinoxate, avobenzone, or added Vitamin A.
BPA & phthalate-free tube from >50% PCR recycled #2 plastic. Safe, Effective, & Gentle Baby Sunscreen. 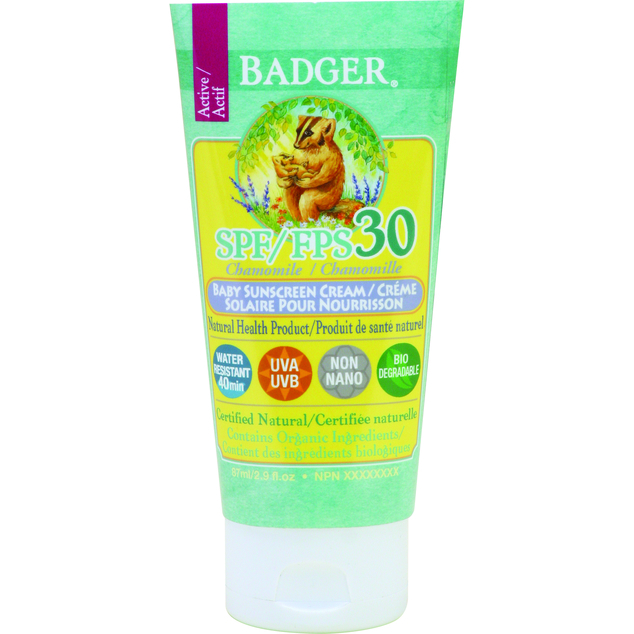 Badger's SPF30 Baby Sunscreen Cream contains non-nano Zinc Oxide to protect from both UVA & UVB rays, in a base of safe, soothing USDA Certified Organic ingredients. It is water & sweat resistant for 40 minutes, biodegradable, and works immediately upon application. Badger sunscreens have been recommended by the Environmental Working Group, Consumer Reports, the TODAY show, SAFBaby.com and numerous other sources. Packaged in a BPA- and Phthalate-free, recyclable #2 plastic tube. This Baby Sunscreen Cream has the mild scent of Chamomile and Calendula, and can be used by the whole family! Pediatrician tested & approved safe for babies and kids. Directions for use: Knead tube before each use. For full protection, apply liberally (2mg/cm2 of skin) to all exposed skin, then rub in to reduce whitening effect. Children under 6 months of age: ask a doctor.